Summon: Give a friendly creature Cover. Your opponent can't target it with actions until your next turn. Shadowmaster is an epic Agility creature card. It is part of the Heroes of Skyrim expansion. The card's summon ability applies the Camouflage card effect. 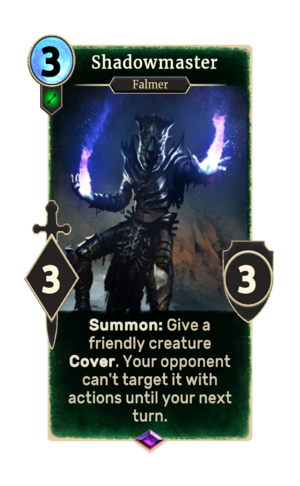 The card is named for Shadowmasters, a class of Falmer which appeared in Skyrim.